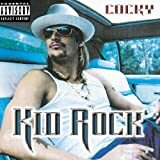 These are lyrics by Kid Rock that we think are kind of repetitive. ok, 1st of all this is the chorus and the song starts like this and he says it over and over and over. second of all, what does it mean? Kid Rock's, "Wasting Time "
I been sittin' here just wastin' time drinking, smoking, thinking, trying to free my mind. I been sittin' here just wastin' time drinking, smoking, trying to free my mind. Yeah, smoking, drinking, and thinking are good ways to free your mind. But you've apparently done too much of all those things.